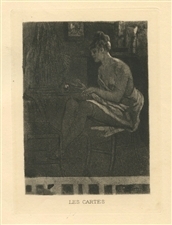 Felicien Rops engraving "La Femme au Trapeze"
Medium: heliogravure. This classic Felicien Rops engraving is from the 1908 edition, published in Paris by Henri Floury for L'Homme et L'Artiste by Camille Lemonnier. Printed on cream wove paper, the plate measures 8 3/4 x 6 inches (226 x 155mm). Not signed. Condition: there is some glue residue in the left margin, outside the plate and not compromising the image. 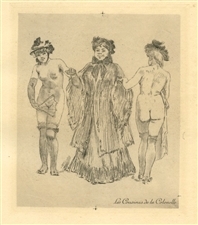 Felicien Rops engraving "La Greve"
Medium: heliogravure. 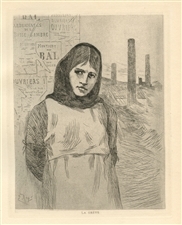 This classic Felicien Rops engraving is from the 1908 edition, published in Paris by Henri Floury for L'Homme et L'Artiste by Camille Lemonnier. Printed on cream wove paper, the plate measures 7 3/4 x 6 inches (195 x 155mm). Signed by Felicien Rops in the plate, not by hand. 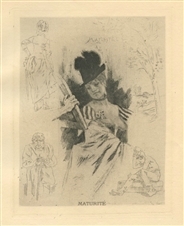 Felicien Rops engraving "La Maturite"
Medium: heliogravure. This classic Felicien Rops engraving is from the 1908 edition, published in Paris by Henri Floury for L'Homme et L'Artiste by Camille Lemonnier. Printed on cream wove paper, the image measures 7 3/8 x 5 3/4 inches (188 x 145mm). Not signed.